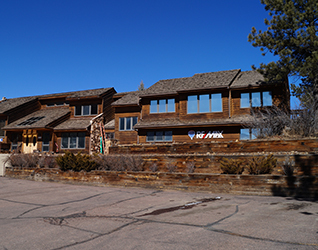 Amazing Pikes Peak Views at 9,200 feet with southern exposure in small private gated community! Property connects to National Forest where there are several hiking trails with 1/2 to 1+ mile loops or out and backs. Walk, mountain bike, or back country ski to Rampart Reservoir. Property borders National Forest. 3 bedroom/2 bath addition in 2008 with new boiler/hot water system. 7.2 Meg Download / 1.2 Meg Upload speeds on DSL. Main Level Living inlcudes: Master BR Suite that includes a gas fireplace, heated floors, 2 person soaking tub, steam shower, Kohler 10 jet massage with waterfall and steam shower, heated toilet seat, ceiling speakers, plumbed for 2nd 1st Floor washer/dryer, built-in closet shelving system, and is adjacent to the outdoor hot tub. 1st Floor Office (instead of 6th BR). Chef's kitchen includes a 6 burner AGA gas range with 4 ovens (baking, convection, broiling and warming), custom professional hood, and under-cabinet microwave, pantry, and butler's pantry. 2nd MBR, In-law Suite, or Guest BR on the 2nd Floor. Lower walkout level has 3 Bedrooms, 2 Bathrooms, Family Room, and Laundry Room. Oversize 2 car garage with workbench and attic storage space, 1st floor speaker system, Humidifall, heated wood and bathroom floors in addition and upstairs bathroom. Storage in crawlspace under kitchen/dining area. Central vacuum and recirculating hot water system. New well pump, water pressure tank, and water pressure booster in 2018.